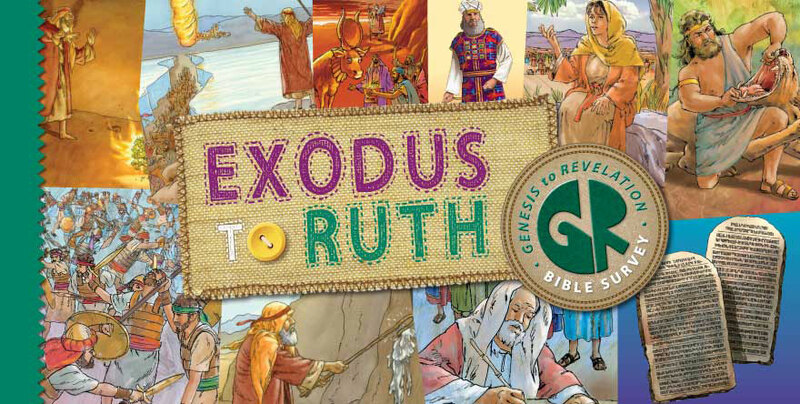 The Exodus to Ruth study of G2R Bible Survey kicks it into high gear on the journey from Genesis to Revelation. In this study, you cover 7 books of the Bible in 13 lessons, starting with the exodus from Egypt and ending up in the Promised Land. Click here to see the master plan. In previous Sunday school departments students have learned about Moses, God’s deliverance of the Israelites, the law, and the wilderness journey. They’ve looked at Old Testament worship. They know about Joshua, some of the judges, and have learned of Ruth’s faithfulness. Now they will put all this into historical and chronological context. They’ll fill in the gaps to get the big picture of God’s redemptive work in the lives of his people, from when they were enslaved in Egypt to the time when they lived in Canaan, the Promised Land. As they look at how God delivered his people and patiently taught them what it meant to live holy lives, your students will see God’s plan of redemption open up through the Scriptures. When they study how the Israelites disobeyed God during the time of the judges, they will observe that God judged them yet continued to save a people for himself for his glory. And when Ruth and her family arrived on the scene, God was clearly working through them as part of his promise to send the Savior. Each lesson in this study does something crucial for your students: It ties each event to God’s redemptive promise and plan to redeem a people for himself by sending the Messiah, Jesus the Christ. The Bible is God’s story of salvation through Christ, who is the focal point of all Scripture.